Hi Everyone! 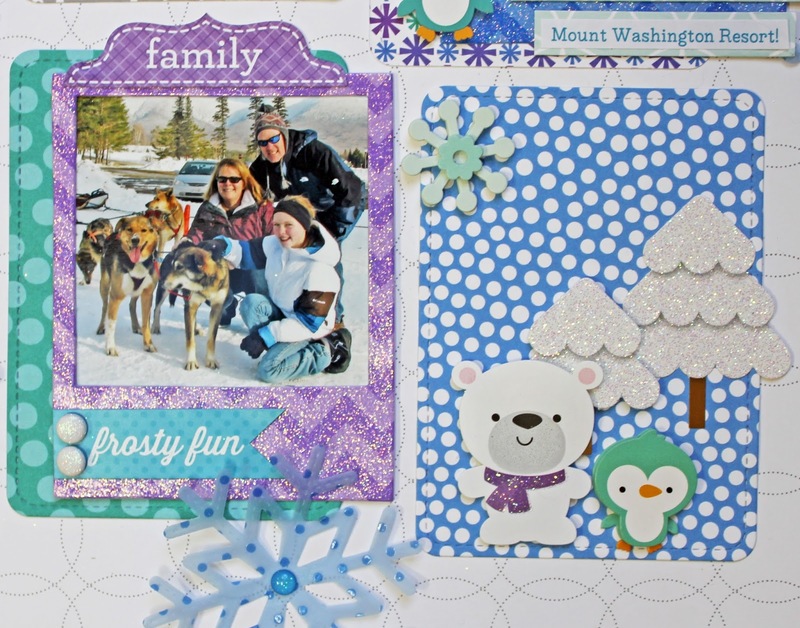 It's Kathy today with a layout I created using the new Frosty Friends Collection. I love the colors of this collection, they are some of my all-time favorites! They were perfect for these pictures of my family dog sledding up in New Hampshire a few years back. I opted to go with a Project -Life like layout so that I could showcase more of the papers and embellishments. I started by framing my background paper with some of the new Frosty Friends washi tapes. I used some Chevron Sugar Coated Cardstock to cut some Insta frames for my pictures and some Sprinkles Vellum to create some coordinating snowflakes. I love how all Doodlebug uses the same colors across multiple collections, it makes it so easy to mix and match! The Frosty Friends Icon Stickers and Doodlepops are too cute! I adore the little penguins! I also love the new Sprinkles! They're sparkly!! For my title, I used the Winter Stickers from the This and That Sticker Sheet, and added some Lily White Chippers to complete it! And no Doodlebug winter collection would be complete without the adorable little snowmen!! There are snowmen stickers, Doodlepops and Sprinkles!! That's it for me today! Make sure to keep stopping by the Doodlebug blog for more Frosty Friends inspiration! Thanks for stopping by. OMG Your LO is absolutely Fabulous and Fun!! What Precious pics!! You really did one outstanding creative job...and wow love all the Frosty Friends gosh is all so cute and adorabs. You are an extremely talented scrapper. YOU so ROCK!! Adorable layout! My favorite element is that cute little bird with earmuffs! That is the cutest layout!!! I just love it!!! What a cute layout! I really love the colors in this new collection and the cute critters. LOVE the circly background, LOVE the washi borders and really LOVE the pretty purple!!! 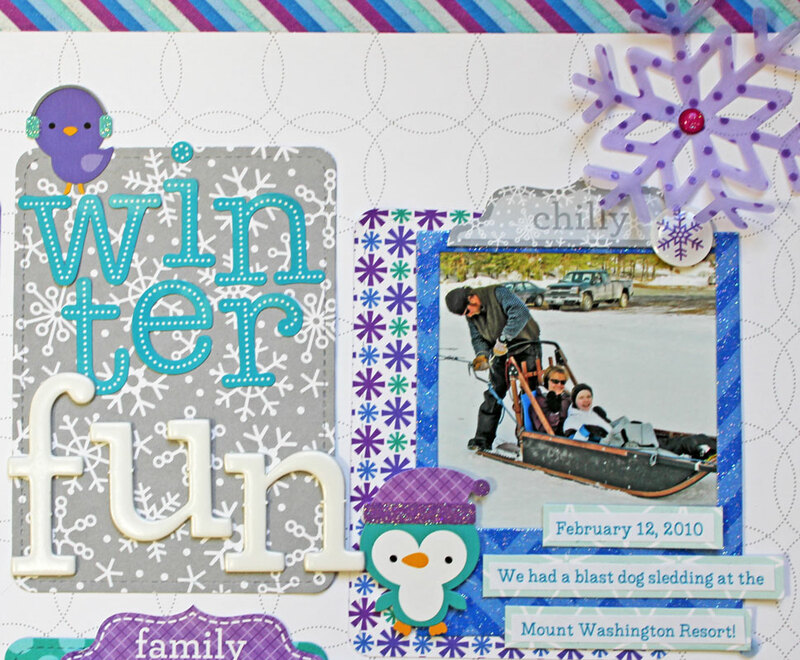 I pinned the close-up pic of Kathy's layout, showing the Lily White chippers "fun" in the title, Winter Stickers from the This and That Sticker Sheet and Sprinkles Vellum to die cut the snowflakes - cuteness galore, especially with the POP of pretty purple!!! Loving the colors in this collection! Lovey layout! The colors in this collection are beautiful and I love that the combination is very unique! Super cute layout! This must have been a lot of fun to put together! I really love how you don't have to have a 12x12 pad to complete this layout - gives a great way to use the 6x6 and still come up with a fabulous result. I just love this layout! I can't wait to play with this collection as well!! I love this LO and this collection. Une page pleine de peps. j'aime beaucoup. Epinglée et partagée. I love this layout. Pinned and shared. So cute Kathy, congrats on your win with this layout at Scrapbook.com. Hugs my friend. I love this Project Life look on this scrapbook page!! Had to pin it for future inspiration!